By this point in the winter, I am ready for some sunshine!! This Utah weather is looking like it will be a little while before I get to enjoy that sun, so these happy lemon cookies will have to do. 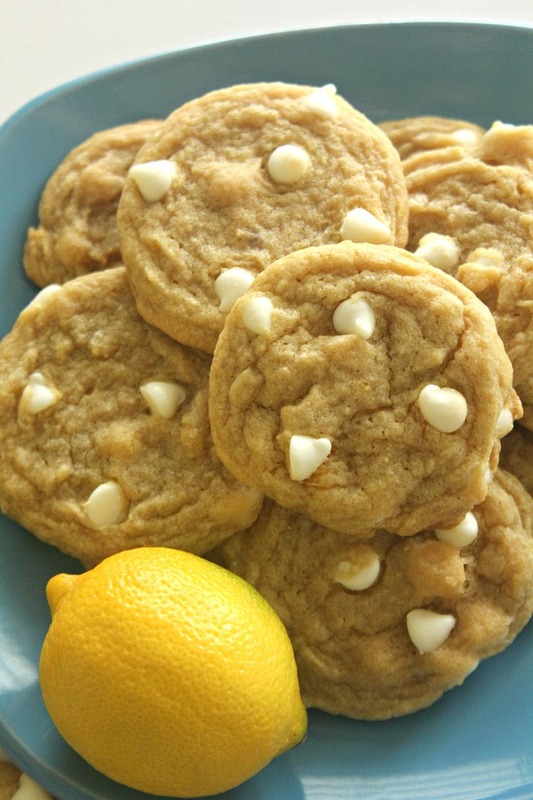 These soft cookies are bursting with lemon flavor and are absolutely delicious. They will quickly become a family favorite! Preheat oven to 350 degrees and line baking sheets with parchment paper or a silicone baking mat, set aside. Add softened cream cheese, shortening, eggs, and sugar to stand mixer or large mixing bowl. Cream together for one minute. Add melted butter and pudding mix and stir for an additional minute. Add almond extract and mix until combined. In a smaller separate mixing bowl, sift together baking soda, baking powder, salt and flour. Add dry mix to wet ingredients and mix until completely combined. Fold in white chocolate chips. Place spoonfuls of dough on prepared baking sheets and bake for 8-10 minutes until tops and edges are starting to turn golden brown and cookies are lightly set (make sure to not overbake!). Cool on pan for 3-5 minutes before transferring to cooling racks. Allow to completely cool before serving. Fantastic cookies, will add these to my Christmas cookie tin. Nice addition of yellow color to the chocolate..
Can you please tell me about how many cookies this will yield? I am doing gift bags for the elderly for Christmas and need to figure out if I will have to double the recipe. It makes 30 cookies. It is posted above the recipe. You are so sweet to do this for the elderly for Christmas!